One of Australia’s finest and most critically acclaimed writers returns with a powerful novel that goes back to the very beginning of the story, to bring his sweeping Glenroy series to a magnificent close. We have certain expectations of a novel, don’t we? We read to take a journey that we cannot influence. We want to be swept along and if, by the means of our reading, we learn more about our humanity then that is an added bonus. A fresh perspective is the gift that a novelist can offer us. In this regard, Steven Carroll is a generous and convivial author. His Glenroy series has spanned one hundred years of Melbourne life and his latest novel, The Year of the Beast, is the sixth and final volume. It centres on pregnant Maryanne, who is living in our great city as World War I rips open everything. Told as if we are all observers looking at Maryanne from afar and from within, Carroll writes of her despair at the war, the Church and the law. He records the momentum of the war festering as if it were a separate entity in the city. It becomes a beast, a force that cannot be stopped despite the cries from the Women’s Peace Army, the newspapers and Maryanne. The Year of the Beast is written with a perfect poetic pace that gives us a chance to view and feel both the minute and the expanse of the times in which it is set. The historical, linear narrative presents an opportunity for us all to ponder how and when personal action determines what happens – on a given day, in a particular life, for that person, for others, and on other days, in other lives, for us and for others. 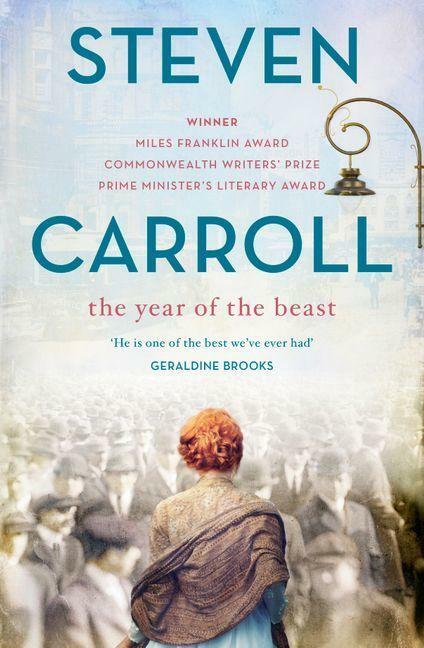 Melbourne is Carroll’s city and it is through this new novel, this seamless, delicious read, that he presents a story of our home to us, and for us. A rare gift indeed. Christine Gordon is the events manager for Readings.